Next season is looking real good for us. We have a lot of returning talent. Last season against St. Aug I had my best tackling game. Tyrann Mathieu is my favorite player because even though he made some mistakes, he still bounced back from them. I started playing when I was 6 years old. I see myself becoming a personal trainer. I am being recruited as a CB and a return specialist. CB is my favorite position because I love playing defense. 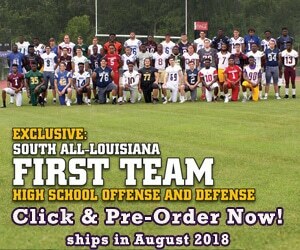 Tulane, ULL, Southern Mississippi, Louisiana Tech, Nicholls State, and Southeatsern.